Background There is a well documented link between low socioeconomic status and mortality in acquired cardiac disease. The relationship between socioeconomic status and survival in adult congenital heart disease has not been explored. We sought to define this relationship in a national cohort of adult survivors of tetralogy of Fallot, the commonest cyanotic congenital cardiac lesion. Methods Prospective landmark analysis of a national cohort of adult survivors of tetralogy of Fallot followed up by the Scottish adult congenital cardiac service for Scotland (SACCS). 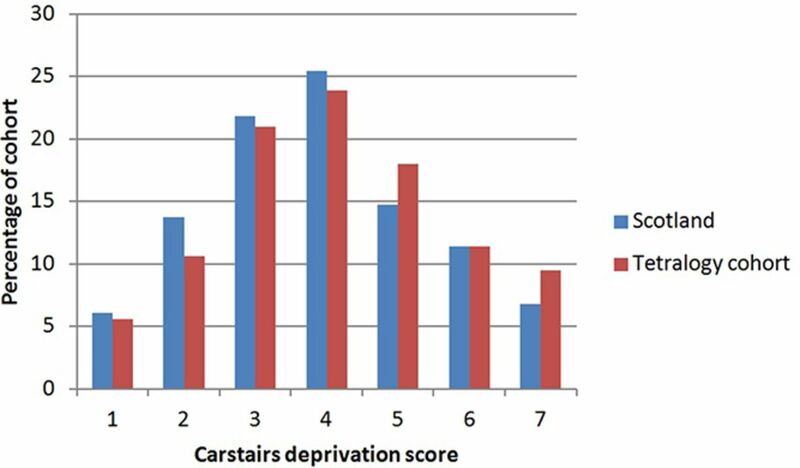 Comparison of distribution of Carstairs deprivation scores with national data for Scotland. Kaplan Meier curves to define survival by Carstairs deprivation category within the cohort. Results We identified 382 adult survivors of tetralogy of Fallot throughout Scotland (225 male, 157 female). 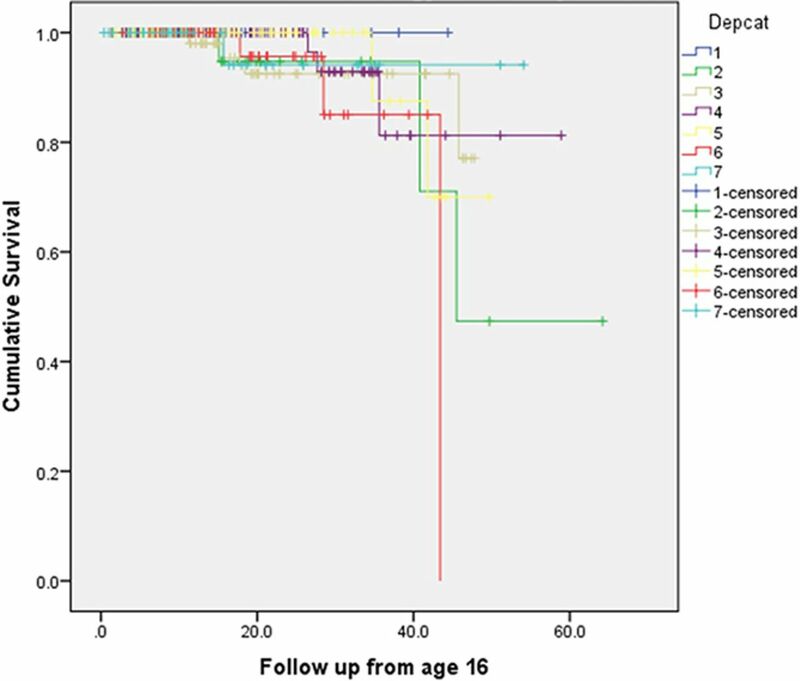 Transition to the adult service occurs at approximately age 16, andmean follow-up from this baseline was 19.1 +/- 12.6 years). We identified Carstairs deprivation categories (Depcats) from the 2001 census for the cohort as follows:5.6% Depcat 1, 10.6% Depcat 2, 21.0% Depcat 3, 23.9% Depcat 4, 18.0% Depcat 5, 11.4% Depcat 6, 9.5% Depcat 7. This distribution was not significantly different from the overall distribution of Depcat scores for the whole population of Scotland (.98) (Figure 1). Cumulative survival for the cohort was 0.83 at 40 years from baseline, and there were 16 deaths in total. There was no statistically significant difference between survival in each deprivation category by Mantel-Cox log rank test (p = 00.745) (Figure 2). Conclusions In contrast to other cardiovascular disease in Scotlandthere is no statistically significant association between mortality in adult survivors of tetralogy of Fallot and socioeconomic status. Although the reason for this remains unclear it may relate to the provision of a national service which provides regular follow-up and timely intervention for these complex patients.Comparison with less centralised services is warranted.